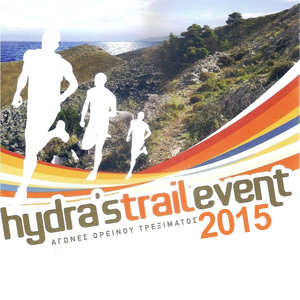 Hydra's Trail Event is a new race weekend that comes to rock the boat of trail running in Greece. The originality of the weekend comes from the fact that it is the first race downhill in Greece to be held Saturday at noon. It is a unique occasion to discover the unique treasures that are hidden in this small area, but so large in history and peculiarities of this island. Welcome to Hydra’s Trail Event, organized in an island that offers elegance and tradition in all its glory at a very good period as it will not be crowded and thus giving the chance to visitors to live like locals in a place that has kept its traditional unique architectural character and the virgin landscape unharmed by modern interventions. 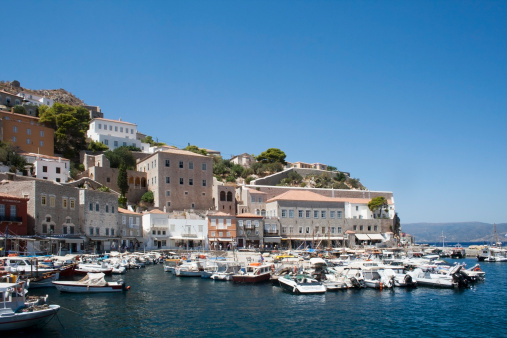 Hydra, one of the Saronic Islands of Greece, located in the Aegean Sea between the Saronic Gulf and the Argolic Gulf. 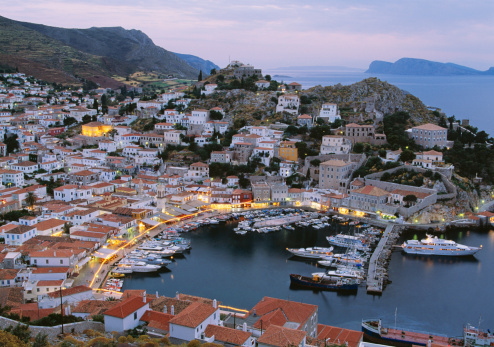 Because runners will have the opportunity to experience the combination of the cosmopolitan atmosphere, the diverse and natural environment and the rich tradition that makes Hydra a unique place. Contact us and we will make you an unbeatable offer to suit your needs and preferences. We offer several options varying from short weekend breaks in Hydra including your entry to the race, to a full vacation plan in Hydra and the surrounding area! Moreover, we can offer you training plans, actual training in the streets and routes of Hydra and of course we will run with you! Entry Fee: Your participation to the race is paid and secured by RunninGreece. Registration is open until Wednesday, 1st of April 2015. Participation can be obtained via online registration. In any case all runners participate solely at their own risk. The organizers have no responsibility for whatever happens to the runners related to health issues or is due to lack of preventive medical check. It is highly recommended that the participants undergo a thorough medical examination before entering the race. The organizers will not ask for medical certificates from any athlete (male and female), since they all participate at their own exclusive risk and responsibility (children are at the liability of their parents or guardians). We will also provide offers for special health checkup for all runners, and members of their families. There will be Aid stations to support the runners with bottled water. An Award Medal and diploma are awarded to each of the first three winners of the general classification of each race for Men and Women Categories. All participants who manage to finish the race will be given a commemorative medal and a diploma. 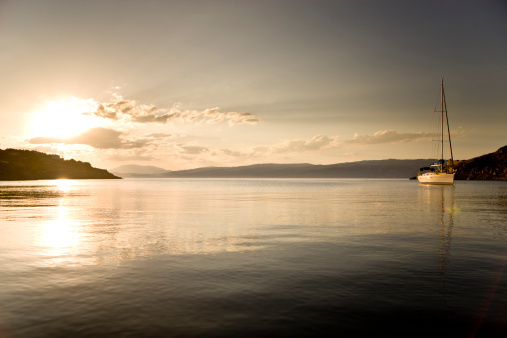 The Simple offer is addressed to those who wish to come and stay in Hydra on their own. It includes all the logistics of the race entry, brunch, cocktails and refreshments after the race, transportation to and from the starting line, tips and advice for the specific race, training schedule depending on your personal targets and safe keeping of your belonging during the race. If you really want to feel like a champion, we are here to support you! This offer is ideal for those who want to experience Greece the "running way", and get the most out of their visit in Greece. We have selected the ideal locations for you, and we will suggest you the ideal vacation plan. It includes the round trip from Hydra to starting line and the hotel arrangements in Hydra and the hotel arrangements in Hydra. It also includes your registration to the race and all the logistics of the race entry, transportation to and from the starting line, tips and advice for the specific race, training schedule depending on your personal targets, safe keeping of your belonging during the race, suggested vacation plan for all the days that you will be in Greece, and many more! It starts from €100 per person (runner or not) per night for a two days /one-night accommodation in a 3star or equivalent hotel. If you wish to stay longer, you may add as many nights as you want for an additional €40 per night per person. Please tell us all your requirements and preferences, how many days you want to spend in Hydra, what other places you wish to visit and we will come back with a tailor-made offer specific for you! We can add trainings, running tours, car/bike rental, excursions, family activities and many more. In any case our offer will include the hotel arrangements, transportation to and from your hotel, participation to the race and all the logistics of the race entry, transportation to and from the starting line, tips and advice for the specific race, training schedule depending on your personal targets, safe keeping of your belonging during the race and suggested vacation plan for all the days that you will be in Greece. If you are a group of people, please tell us all your requirements, how many of you are running, what you like and what you do not like and we will come back with a tailor-made offer specific for you and your company! We can add trainings, running tours, car/bike rental, excursions, family activities and many more. In any case our offer will include the hotel arrangements, transportation to and from your hotel, participation to the race and all the logistics of the race entry, transportation to and from the starting line, tips and advice for the specific race, training schedule depending on your personal targets, safe keeping of your belonging during the race and suggested vacation plan for all the days that you will be in Greece. The island of Hydra is situated approximately 44 nautical miles south-west of from the Athens port of Piraeus and is one of the Saronic Islands of Greece, located in the Aegean Sea between the Saronic Gulf and the Argolic Gulf. Hydra, built in the shape of an amphitheatre on a slope overlooking the Argosaronic gulf, is one of the most romantic destinations in Greece. 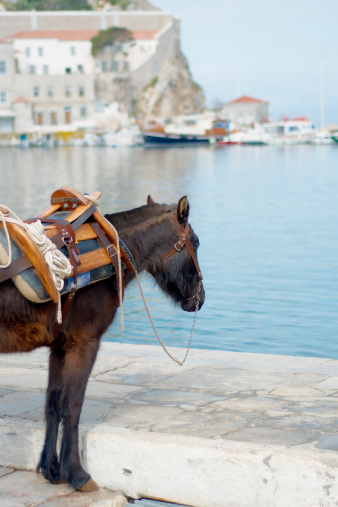 Traditional stone mansions, narrow cobblestoned streets, secluded squares and above all the banning of cars and the use of around 500 donkeys as means of public transportation, explain the reason why Hydra preserved its distinctive atmosphere through the passage of time. It is the most impressive island in the Argo-Saronic Gulf and due to its close distance to Athens, it gets very popular as an all seasons weekend destination. Lavish stone mansions owned by important families and built by Italian artisans reveal the wealth that experienced the island in the past. Today most of these mansions house the island’s museums. 300 churches and 6 monasteries spread around the island as well as the cannons and the statues of the Independence War heroes still standing at the balconies of the islands create a romantic mosaic. The sea around Hydra is deep, clear, and cool. 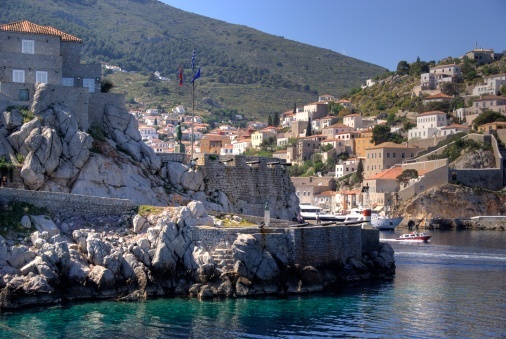 Most of Hydra’s swimming areas are located on the rocks lining the island’s coast, though there are a few sand or pebble beaches. Beaches on the island are actually small coves with crystal water and green surroundings. Agios Nikolaos, Bitsi, Vlichos and Kaminia are the most beautiful ones on the island. 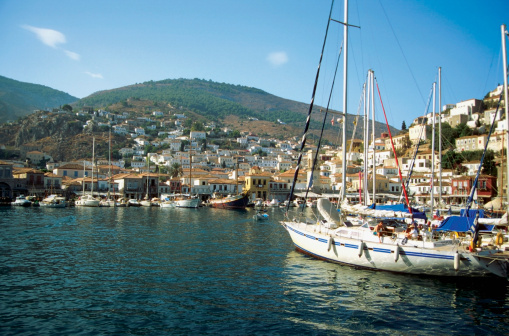 Hydra is also a yachting paradise, as every summer groups of sailing boats moor at the harbour, where they are joined by dozens of sensational motorboats and yachts. It’s worth mentioning that Hydra became famous all over the world thanks to the film “Boy on a Dolphin”, shot on the island in 1957 with Sophia Loren leading the starring role. On a visit to Hydra, tourists can soak up the island’s rich history and culture by visiting the island’s mansions, museums, galleries, churches, and monasteries. Visitors should not miss to wander the quaint and charming cobblestone streets past brightly colored doors framed with brilliant bougainvillea or plumbago, stroll the road along the coast with its stunning Mediterranean views, or hike the island’s rural trails, past pine trees and olive groves, shepherds herding sheep, and donkeys grazing patiently in the fields. It is worth browsing the boutiques and gold shops and enjoying a quiet, traditional taverna meal in one of the neighboring villages. The Spring season is very colourful on Hydra when all the flowers are so vibant. The island's flora and fauna is most obvious in April when the temperatures begin to rise and the rain is just gentle enough to make everything bloom and for the wildlife to come out of winter hiding to find mates. Thank you for your interest to this event. Unfortunately, you are not able to register to this year’s event. Keep visiting www.runningreece.com to be informed for the next year’s edition. You can subscribe to our newsletter and we will keep you informed for all the upcoming events. 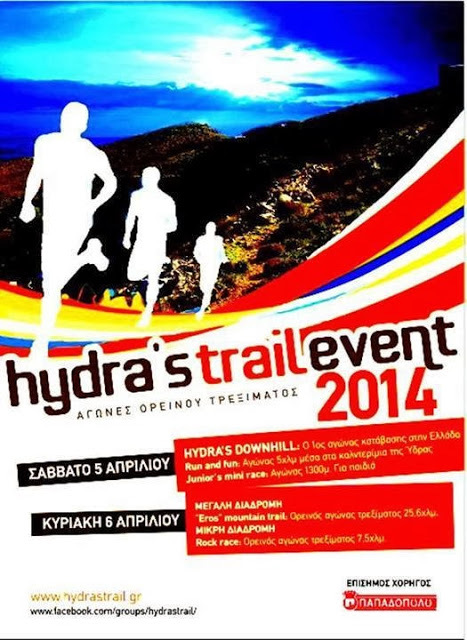 Please browse www.runningreece.com to find another event in similar dates or location. We are looking forward to seeing you running with us! Select your travel offer. For more info please see the appropriate section. Running offer is for 3days/2nights. Select the total number of runners and fill below their information. If runners are more than five (5), please select the group application form. Select the number of the travelling persons. Please leave these fields empty. Select how many rooms you want to book. I participate to the race on my own responsibility, having made any medical check. I will not ask for anything from the organisation in case of injury during or shortly after the race. I also agree on the free use of my name/photo by the media. I have read and agree to the terms outlined under Booking Conditions. Travel insurance is not included in the price of the package.